You see, Johnny Capes was the sole survivor of a British submarine… he escaped through a hatch from a submerged depth of 180 feet with just a bucket on his head. 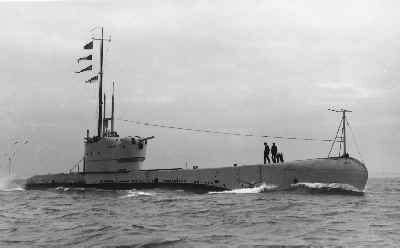 In 1941, during World War Two, HMS Perseus struck an Italian mine and was lying critically damaged on the seabed in the Mediterranean, just six miles off the coast of the Greek island of Cephalonia. Not only did the magnificent Capes survive to reach the surface, he then swam the six miles to Cephalonia, was found and rescued by Cephalonian Partisans, lived wild in the mountains and fought with the Partisans against Italian occupiers for nearly two years before escaping to Turkey to find his long way home. Tough stuff eh? Much later, at some unknown point, Capes and my old man became great friends. This enabled intimate knowledge of the infamous escape to pass from Capes to my father. You see, they were both submariners and only submariners have the special relationship the rest of us don’t understand. Having said that, there’s no concrete evidence that my father was ever in submarines. But, nevertheless, when you’re a young kid you hang on to every word your father tells you. Like Capes, my old man was never a cultured fellow. He’s infamous for always having a Capstan Full Strength cigarette dangling from one side of his mouth which, I gather from most, is a death defying feat in itself. These cigarettes were commonly referred to as coffin nails. But he has a skill in story telling matched only by his own father who, incidentally, was the first man to jump without a parachute from a flaming World War One aeroplane and survive unharmed by landing in a tree. Unbelievably, the same thing happened again early in World War Two when he landed in the same tree. We now need to fast forward to Croatia 2004. My father, in his day, was undoubtedly a master of the sea. 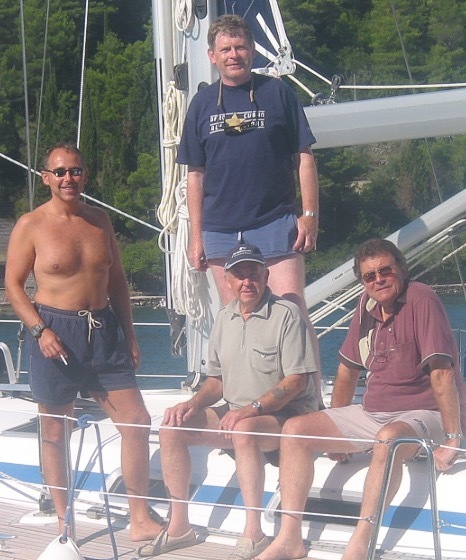 Having just carried out extensive repairs to my sailing boat Sänna in Dubrovnik following the marina there dropping another yacht onto mine, we spent three wonderful months together whilst he helped get everything ship shape to sail away. Later, we were joined by three of his close friends for a few weeks of carefree adventure sailing I’ll forever treasure. Irreplaceable fun, escapades and laughs. My father, in his captivating way, was at the centre of most of it. During those whisky filled evenings, sitting on anchor somewhere within the incredibly scenic Croatian islands, I listened once again to my old man’s stories not only of his friend Johnny Capes, but of his escapades in the beguiling Four Floors of Whores in Singapore when his ship HMS Belfast left for Hong Kong without him, how he featured in the marvellous war movie The Cruel Sea, and also of the naval medals won during the Korean War, when he fired shells from his ship at a Chinese infantry unit caught on a railway line between two tunnels. He fired on them in a deliberate way, for many hours, to land the shells just before the tunnel entrance towards which they were fleeing for shelter… to make them turn and run the other way… an incredible feat of accurate naval gunnery. But his true magnificence came towards the end of our sailing adventure. We fouled a rope around our propeller and someone needed to dive the boat to cut it free. Those of you who know about such things know this is not an easy matter and requires skilful use of cutting gear underwater and a working knowledge of scuba diving. We deliberated the problem and, at that time having no scuba equipment onboard, I decided to seek the services of a commercial diver to sort the problem out, snorkelling proving of little value. But why use a diver, my old man argued, when we could simply dive using a hose-pipe to breath, just like he and Capes when their motor torpedo boat suffered the same fate whilst under fire in the Bay of Inchon, Korea, in 1951. To each of us this seemed so logical that we felt stupid for not thinking of it ourselves. It’s difficult to explain the complicated laws of physics that prevent air passing down a hose-pipe underwater when you breathe but, to those of you who are interested, you can read about it in various scientific journals. What followed was a near disaster as I fought for breath whilst dropping my knife, surfacing just in time to save my life… to see my father’s grinning face with a coffin nail dangling from one side of his mouth. It was my fault, he said, incompetence… and Shaun should show me how it’s done. I felt a little ashamed as Shaun took the hose in his mouth and disappeared beneath the boat. Nearly a minute or two later we hauled him up using the rope we’d wisely tied around his waist as an afterthought. He was not in good shape. Later, when the diver came to free the prop we explained what we’d attempted with the hose. He too thought thoughtfully and confessed he saw the logic in our plan. Had he ever heard of Johnny Capes I asked? It seemed he hadn’t but, as a Croatian, that’s not unreasonable you see. The next day, Sergan, the diver, passed by to tell us he’d been thinking through the night and he and his friend had tried the hose-pipe theory earlier in the morning. Emotionally, Sergan told us he’d had to call a doctor for his friend. You see, Johnny Capes must have thought this through. If you place a bucket on your head you can breathe the air trapped inside. It worked for Capes… and if we planned this carefully then I had a means of working under the boat without the need to keep surfacing for air. I could simply put my head back in the bucket and take a breath or two. Like two over excited kids I located our bucket and tried it on my head. I remembered my father, when questioned in detail, specifically telling of Cape’s advice to use the handle as a chin strap to ensure it stays on your head… there’s always a danger it can float away you see. And off I set. I lowered myself down the swim ladder and into the sea with Tony’s ample advice resonating in my ear. My first attempt didn’t get very far. I quickly realised the air inside my bucket prevented me from placing my head under the water because, in physical terms, it acts very much like a buoyancy aid. Then Tony worked out I needed to adjust my weight by just the right amount to achieve something called negative buoyancy. Negative buoyancy is often experienced by none swimmers in its more natural form. So, with a few pounds of lead weight attached to my diving belt, we tried again and, I have to confess, at this stage I was having some second thoughts. But I needed to impress my new found friend. He was an Australian you see. The first shock is how dark it is. But you have to compose yourself by taking deep breaths to ensure you don’t enter into a physical state called hyperventilation. This is a condition in which the body begins to panic because it thinks it’s going to die. Those of you who are sailors out there know that all sea survival training is geared around preventing this. Take deep and long breaths the experts say. Just remember, when you’re thinking about this, when you’re trying not to make a fool of yourself underwater with a bucket on your head… the bucket begins to fill with water when you breath in the air that’s keeping it out. Of course, your air is replaced by the air you breath out but this somehow leaves the bucket of its own accord. Then, as you begin to turn upside down, you have to think quickly how to get the handle off your chin and the bucket off your head. The late, great, Johnny Capes was disbelieved by everyone including the Admiralty when he described how he escaped from the open hatch of HMS Perseus in 1941. He was even accused of deserting before the submarine sailed from Malta. The Perseus sank quickly after striking the mine and only Capes and four stokers remained alive. Together, in complete and total darkness, with water up to their chest and rising fast, they came up with a plan to open the hatch and rise to the surface a hundred and eighty feet above. Of course, there’s no mention of a bucket. Using new and revolutionary emergency breathing gear that was never before tested at that depth, Capes and one other man took one last big swig of rum, opened the hatch and left. Only Capes survived. 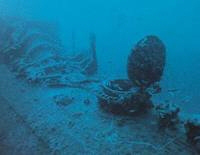 In 1996, two Greek divers found the wreck of the Perseus exactly where Johnny Capes said it would be. They also located the still open hatch and through the hatch distinctly saw an empty rum bottle. Their photographs finally proved the incredible tale of the only man who survived. Only my old man knows the absolute real truth, the whole story, you see. 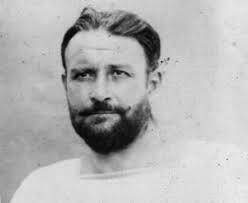 That his mate Johnny Capes is the only man to escape from a sunken submarine with a bucket on his head. You can read the official version of the last voyage of HMS Perseus here. The edited version of this article was published in Practical Boat Owner, August 2015 which you can read here. Dave & Marie Ungless are currently sailing their boat Sänna around the world from west to east. Their nine year voyage so far has taken them into the North Pacific and to Alaska where they are now located. Dave is a freelance writer and journalist writing about their travels and the social aspects of their journey. 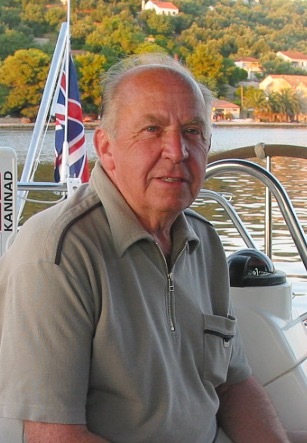 You can view their sailing website at http://www.sanna-uk.com and their sailing blog at http://www.sailblogs.com/member/eastwards. You can also Like their Facebook page at http://www.facebook.com/sv.sanna.